The Fellowship was fortunate enough to obtain a copy of EX SANGUINE #1 from Dark Horse Comics. Joshua Scott Emmons and Tim Seeley write, and Tim Seeley draws. Mr. Adams is not a nice man; this is quickly obvious to Agent Quinn and her partner. But they’re not really sure what to make of him. Until his notebook is found with a corpse. But we know that he didn’t kill the guy; it seems that the new waitress may be involved, though. Mr. Adams is starting to get curious. At first glance this book appears to be a new and interesting take on a vampire story. But it’s not all that clear who or what Ashley is, which makes it that much more fun. And what happened to make Agent Quinn so cranky? All of these unanswered questions make for a delightful first issue; lots of story potential. Great art, too. It’s easy to say that Hack/Slash fans will like this title. 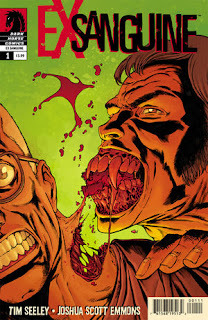 I think if Seeley keeps this up, he might just take over the horror comics world. And I can’t see how that would be a bad thing. 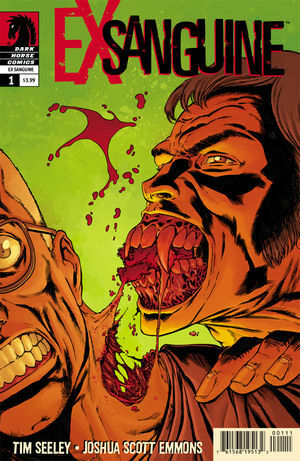 EX SANGUINE #1 is available now at your FLCS or by order from darkhorse.com.